©2019 BREEZE PUBLICATIONS INC. BREEZE PHOTO BY BILL MURPHY Glocester Little League Opening Day ceremonies were held at Acotes Field in Chepachet on Sunday. JOSEPH JOYCE, 11, of the Graham Builders majors team, warms up before the start of his game. See more photos on page 9. SMITHFIELD – If all goes well for the Carpionato Group's plans at the former Benny's location on Putnam Pike, the 1970s building will receive a 21st-century makeover, said attor- ney Joseph Shekarchi. At the Smithfield Zoning Board meeting on April 24, the developer is seeking a special use permit for a drive-thru window and dimensional variances. Shekarchi, representing the Carpionato Group, told The Valley Breeze & Observer that while tenants cannot be announced this early, as contracts are still being negotiated, the Carpionato Group plans to have "nationally and locally recognized" retailers, with a restaurant and a bank as well. "Benny's is a wonderful community store built in the '70s. Unfortunately, we're not in the '70s anymore," said Shekarchi, who is the Democratic majority leader in the Rhode Island House of Representatives. The Planning Board forwarded a positive recommendation to the Zoning Board during its March 21 meeting. Shekarchi said if the Zoning Plans for old Benny's a go upon zoning approval By JACQUELYN MOOREHEAD Valley Breeze & Observer Staff Writer jackie@valleybreeze.com See BENNY'S, Page 4 SMITHFIELD – After present- ers for the 175-unit residential development at the Hope Mill gave three hours of testimony tackling several stipulations placed on the project, the Planning Commission last week decided to push back a decision on master plan approval and public com- ments to the next meeting. During a meeting last Wednesday, April 3, Planning Commission Chairman Jeffrey Hanson said he and board mem- bers will need time to review the updated plans from the developer, Paramount Development Group. Though the decision deadline on this project is not until June 4, Hanson said the commission will most likely make a decision on master plans for the Hope Mill during its next meeting at the Scituate High School auditorium on Wednesday, April 24, at 7 p.m. "We do have until June, but I'm not looking to push it any further New conditions set for development of Hope Mill By JACQUELYN MOOREHEAD Valley Breeze & Observer Staff Writer jackie@valleybreeze.com See HOPE MILL, Page 10 SMITHFIELD – Smithfield High School senior Jonah Major stood in front of the entire student body and reminded them that when it comes to high school, "this is all a bizarre farce." 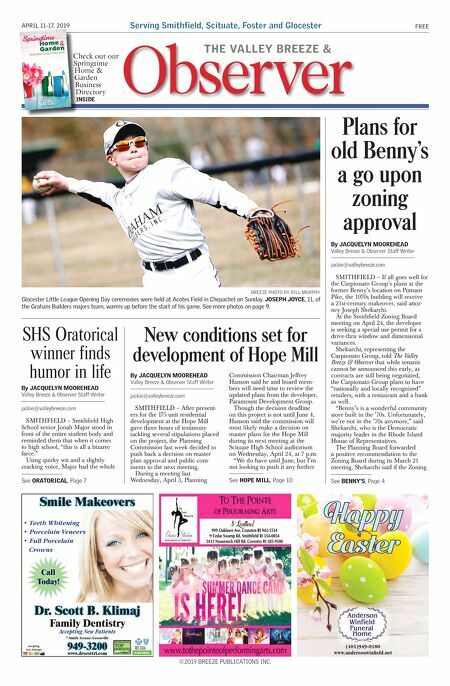 Using quirky wit and a slightly cracking voice, Major had the whole SHS Oratorical winner finds humor in life By JACQUELYN MOOREHEAD Valley Breeze & Observer Staff Writer jackie@valleybreeze.com See ORATORICAL, Page 7 Serving Smithfield, Scituate, Foster and Glocester FREE APRIL 11-17, 2019 Observer THE VALLEY BREEZE & Dr. Scott B. Klimaj 949-3200 Family Dentistry Accepting New Patients 7 Smith Avenue, Greenville www.drscottri.com Accepting New Patients Smile Makeovers • Teeth Whitening • Porcelain Veneers • Full Porcelain Crowns Call Today! Happy Easter (401)949-0180 www.andersonwinfield.net Check out our Springtime Home & Garden Business Directory INSIDE Check out our Springtime Home & Garden Business Directory INSIDE Published by BUSINESS DIRECTORY 2019 Home Garden Springtime & ©2019 BREEZE PUBLICATIONS INC.